Unless the rifle is used for short range shooting, as hunting deer in the woods	of West Virginia where shots over 50 yards are unusual, I suggest floating the	barrel and relieving the action. This is especially true for wooden rifle	stocks but can also be justified for synthetics, as neither are completely	stable under varying conditions. The barrel channel and action area should be sufficiently larger than the	running diameter of the barrel and action to not allow stock moisture or	resident chemicals to cause the stock to warp enough to stress the barreled	action under any shooting	condition. The following procedure specifies the absolute minimum clearance between barrel	and channel. You can increase the specified barrel channel clearance to about	0.07 inch, just slightly greater than 1/16	th	inch, if you like. Floating and properly bedding a rifle pays off when needed. 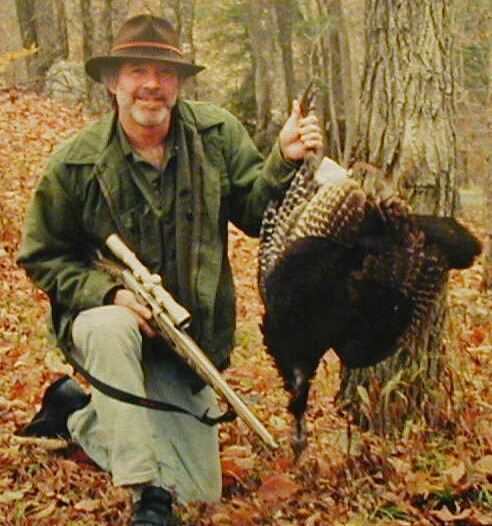 I held high on	this turkey aiming at center of neck expecting bullet to drop into heart/lung	area. I misjudged distance and hit the turkey where I aimed - 63 yards. Don't ask me to do it again. Floating the barreled action involves relieving all stress points and	potential stress points to all metal parts of the firearm. The barrel will	have no less than 0.05 inch clearance of stock and greater, up to about 0.07	inch, is better. The action, bolt handle and trigger assembly will have	approximately 0.02 inch clearance. The magazine	should have a bit more, say	0.03 inch but can be greater, since it is capable of movement non-relative to	action. At a minimum a short section from front of	magazine box to just past	recoil lug will be	glass bedded	. Pillar bedding	is recommended for all wooden stock rifles subject to anything more than short	range shooting. If you are working with a semi-inletted stock complete	action	and	trigger guard	inletting before floating the barrel. It may also be wise to not fashion the	exterior of forearm until barrel channel has been widened. This will ensure	plenty of wood for forearm is left. Find some good plastic adhesive tape. Electrical or plumbers tape will do. If	you do not know the thickness of the tape, cut small lengths. Stack a few	together and measure thickness with a caliper or micrometer until you find the	number of layers needed to achieve 0.05 inch thickness. Cut one short piece of	tape. Wrap it around barrel about one inch forward of forend tip. Remove	barreled action from rifle stock. Set magazine, bolt, guard bolts and trigger	guard aside. They will not be needed for some time. We will tape the bottom	half of the barrel circumference to increase its horizontal diameter by 0.05	inch. On the bottom of barrel run one piece of tape from front of recoil lug	to the tape	band you applied just forward	of forend tip. If the tape is not	wide enough to cover half the circumference of the barrel another strip or two	will have to be run adjacent to it. Uniformly add layers of tape until 0.05	inch has been	added to barrel from front of recoil lug to forend tip. The tape	should	conform to the contour of the barrel. The barrel channel will be	expanded to allow taped	barrel to seat in stock, at which time the channel will	be 0.05 inch deeper at all points than before. Using the cylindrical sanding form deepen the barrel channel bottom and sides	without allowing sand paper to touch the tops of channel. Use the small	sanding block for expanding the tops of channel and take care to retain its	original contour. Angle the sanding block slightly into the channel as you run	it the length of channel. This will help keep the drop into channel sharp and	crisp. Periodically check fit with barreled action. Check fit more often as	more wood is removed. Wood lose seems to occur more easily at forend tip so	take it slow at that area or an unsightly gap will occur. The gaps can be	greater than 0.05 inch in areas of the channel that will not be seen and	it may help precision. Do not allow gaps that will be seen to be non-uniform	in width. When barreled action will seat without friction remove tape. With	rifle assembled check appearance. Disassemble and touch up wood that does not	conform to contour. Using the sanding block sand action inlet until you can slip a paper business	card between stock and action from front of receiver to tang . Do not remove	wood from bedding of action (where guard bolts attach). That should be done	during the glass bedding procedure. Likewise remove wood around areas	of magazine and trigger assembly. Remove just enough wood around trigger	guard/floor plate inlet so that with one piece of electrical tape wrapped	tightly around trigger guard the guard will fit snugly into inlet. Do not	remove wood from trigger guard bedding (that which it fastens against when	assembled). With rifle assembled apply a very thin even coat of inletting	black to bolt handle. Close bolt to check for handle touching wood. If so	remove high spots until handle touches no wood when dropped into closed	position. When finished	seal	the sanded areas or	glass	bed	the stock before sealing. It is advisable to glass a short area from front of	receiver to just past recoil lug. This will relieve the action from supporting	the barrel.